Days Of Our Lives Spoilers: Lani Urges Rafe To Retain Custody Of Baby David – But Does She Have Ulterior Motives? Days of Our Lives spoilers tease that Lani Price (Sal Stowers) will urge Rafe Hernandez (Galen Gering) to keep custody of baby David, but she will have some ulterior motives in mind. Knowing Hope Brady (Kristian Alfonso) will not stand for Rage bringing the baby into their home, forcing Rafe to make the decision to move out, may give Lani much more time with the baby. She is already more attached than she should be. Eli Grant (Lamon Archey) and her father Abe Carver (James Reynolds) will become concerned that Lani is transferring feelings for and attachments to the baby she and Eli lost. She’s already mentioned he is the age her child David Abraham would have been had he been born full term as originally planned. Rafe will need at the very least babysitters or possibly a nanny. He will also need bring-your-child-to-work days in order to keep a six month old baby properly cared for. Of course he could always ask his sister Gabi (Camila Banus) to pitch in sometimes. And she probably wouldn’t mind doing this. But Rafe may be concerned that since she can’t have any more babies because of what happened to her in prison, that she could become too attached – which is exactly what is happening to Lani! Rafe was probably not as close to the situation with David Abraham. So he may not realize what is happening. He may welcome Lani’s help for babysitting as often as she is able to give it! 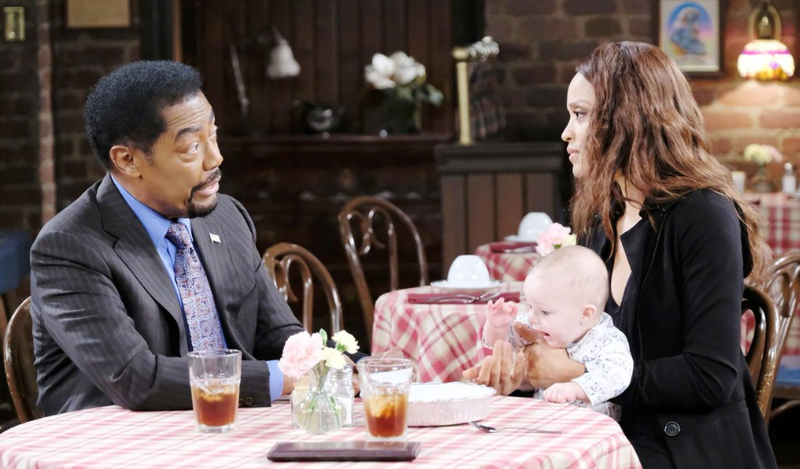 Days Of Our Lives Spoilers – Will Lani Price Be Entrusted To Care For David? Rafe could just opt for a daycare. But with someone like Lani, who he knows and trusts working as hard as she can to be available, it’s an easy choice. Even though baby David’s uncle, Ben Weston (Robert Scott Wilson) is close by, Rafe knows that his mother, Jordan Ridgeway (Chrishell Hartley) is still not comfortable that Ben is a safe person to be around his nephew (although Jordan herself may not be all that safe, either). Ben knows about David, having been told by Hope. But he is still a little skeptical that Jordan could have even had a baby, at least until he hears proof. Stay tuned to Days of Our Lives and check Days of Our Lives spoilers frequently to see all the latest news, developments and spoilers!